Private appointments are perfect for anyone who wants a unique and detailed design for any occasion! Most individuals book private appointments to enjoy a private and relaxing experience, and to adorn themselves with beautiful henna. Henna can be applied to hands, arms, feet, legs, back, stomach, chest, or shoulders. All appointments are completed at our professional home studio. Please email Angela to receive a copy of our pricing guide. Designs begin at $35 depending on density and detail of the design. Having a celebration? Hire Angela and have a blast with 2 hours of non-stop henna! A henna party is a perfect idea for anyone wanting to enjoy something different, fun, and long-lasting! Gather up your girlfriends, turn on the music, and maybe enjoy some wine while Angela creates unique designs for every individual. Angela travels to your location within the Edmonton Area. Typically, 8-10 guests is a perfect number for 2 hours of henna. This allows each guest to enjoy one full hand design. You are welcome to have as many guests as you prefer. If you have less guests, the designs become larger, and vice versa. You are welcome to add additional time if needed for a larger group. Please note the color seen in these photos is loose glitter applied on top of the wet henna paste, and is not "colored" henna. 2 hours of party henna is $225. Each additional hour is $100. A non-refundable $50 deposit is required at the time of booking to confirm and hold your date. Are you an expecting mother? 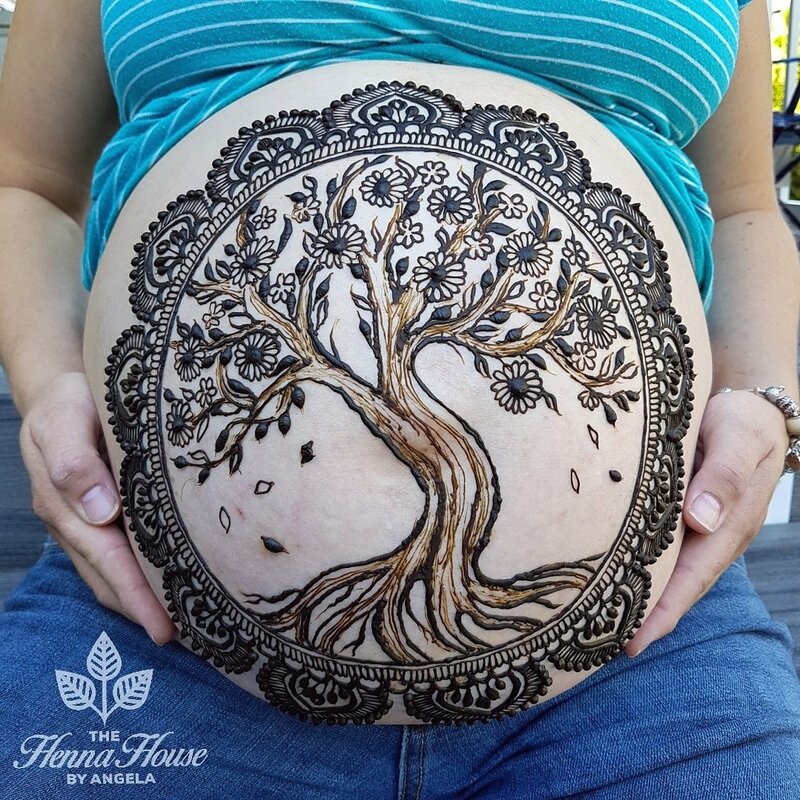 Prenatal hennas are a perfect way to adorn your baby bump during your third trimester! Henna is safe to use on pregnant women with the use of lavender oil (all of our henna cones are made with lavender oil). Decorate your belly prior to a baby bump photoshoot, or just because it makes you feel beautiful! Traditionally, henna was applied to pregnant mothers to help ease the birth of the child and to bring good luck and good health to the baby. The tradition still appears to live on today! Prenatal hennas can be done at Angela's location or in the privacy of your own home within the Edmonton Area. Are you looking to have henna at your baby shower as well? Have the ladies over to enjoy a relaxing experience of getting pampered with henna. Have as many guests as you like! We tailor the size of the design to the amount of guests you have. Prenatal hennas vary between $50-$175. 2 hours of baby shower henna is $225. Each additional hour is $100. It is your special day! 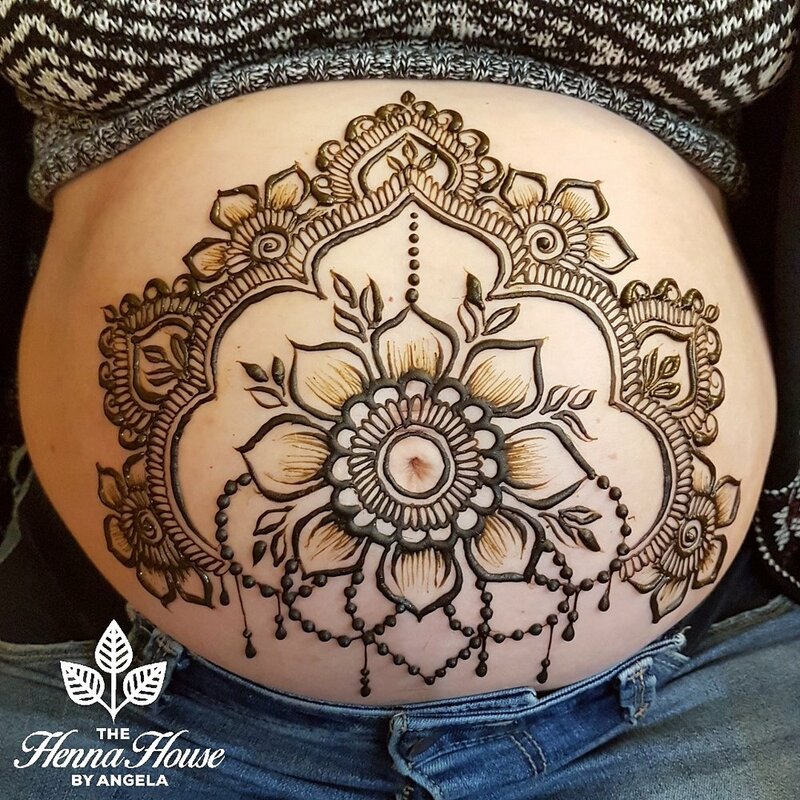 The Henna House takes prides in creating original designs that are tailored to you and your interests. Angela travels to your location within the Edmonton area. Angela currently does not travel outside Edmonton city limits. If you have any questions, please do not hesitate to send us a message. Bridal packages range between $375-$850 depending on size, complexity, and detail. Please send your inquiry to Angela including your date and location. You will receive a bridal pricing guide to assist in choosing the right amount of henna for you. Henna must be applied 2-3 days prior to your main wedding event. A non-refundable $100 deposit is required at the time of booking to confirm and hold your date for bridal henna. Trials: The Henna House offers a simple design front and back of one hand for $35 in henna and $45 in jagua-henna. Looking to have Angela do henna for your guests at your mehndi party? She provides a flat party rate! Additional time may be added depending on the number of guests you have and how much henna you are wanting each guest to have. 2 hour mehndi party for guests is $250. Each additional hour is $125. A non-refundable $50 deposit is required at the time of booking to confirm and hold your date for your mehndi party. 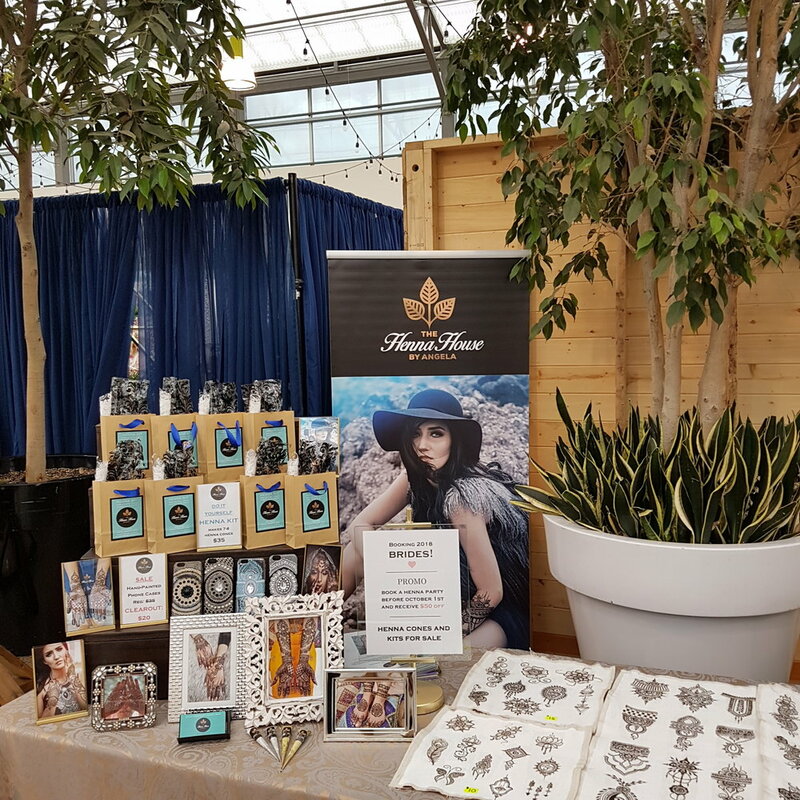 If you are interested in having Angela provide henna at your next charity event, gala, market, festival or staff party, please send us a message! Cost will vary depending on the type of event. Copyright © 2015 The Henna House Inc.